Are you shopping for a groom with a traditional sense of style? Save yourself some time and energy by learning more about our 5mm men’s Benchmark titanium wedding ring with a polished finish. This timeless wedding band will serve as the perfect foundation for your happy union, and we spared no shortage of care in crafting this quality ring with the classic groom in mind. We used aircraft-grade titanium to ensure that this fashion ring can endure the wear and tear of active lifestyles, tough jobs, and so much more. Titanium offers one of the highest strength-to-weight ratios of any transition metal, and this ring will never corrode, dent, discolor, or scratch. Best of all, the men’s Benchmark titanium wedding ring with a polished finish is eligible for engraving. Add up to 30 characters, including spaces, so you can share a special message to enjoy for years to come. Sometimes the simplest design can truly showcase the beauty of a metal, and our 5mm men’s Benchmark titanium wedding ring is no exception. The stunning center inlay is accentuated by step-down edges with a polish that gleams. 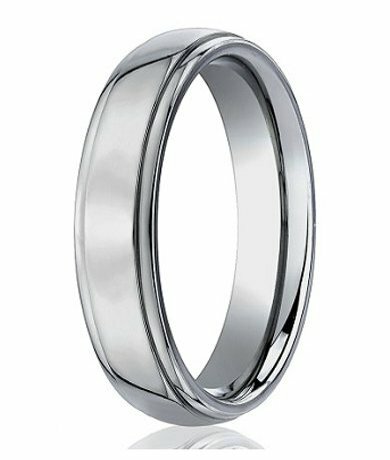 Each men’s Benchmark titanium wedding ring with a polished finish features a comfort-fit band, which is easy to wear and can easily squeeze over large knuckles. Because comfort-fit rings tend to measure a half size smaller than their traditional counterparts, we suggest that he have his finger sized by a professional jeweler to ensure that a comfort-fit style is right for his lifestyle. If you have any questions about this wedding ring, please contact us today. Let us know how we can help you choose the most important ring you’ll ever own or wear.